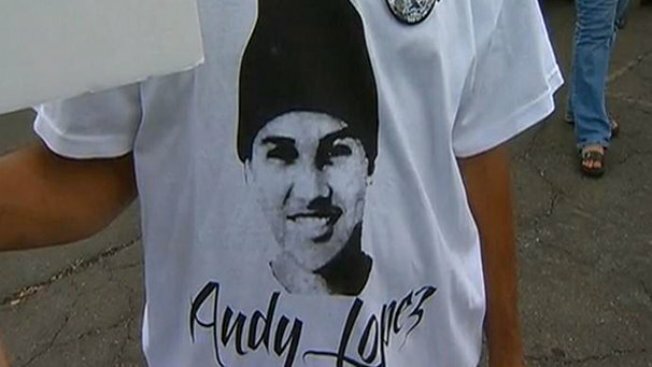 File image of a T-shirt featuring Andy Lopez. A park opened Saturday dedicated to Andy Lopez, a 13-year-old Santa Rosa boy who was shot and killed by a Sonoma County sheriff's deputy on Oct. 22, 2013. "Andy's Unity Park" is located at 3399 Moorland Avenue in unincorporated Sonoma County, the site of the shooting five years ago. The 4.4-acre park includes a memorial garden with a bronze relief model of Lopez and a tile mosaic of his hobbies. Park officials said the closest recreation area is more than 2 miles away and residents had envisioned a park in the area for decades. Two formerly empty parcels now boast a field, community garden, off-leash dog area, basketball court, skate area, playground and picnic area. "The opening of Andy's Unity Park provides a long-overdue resource for the neighborhood and is a direct result of efforts to engage and empower the community," Supervisor Lynda Hopkins, who oversees the area, said in a news release." Lopez was walking and holding a toy AK-47 rifle in rural Sonoma County Oct. 22 in the afternoon when county sheriff's deputies on patrol in the area spotted him and yelled for him to drop the weapon, the sheriff's office said in 2013. When the boy turned toward the deputies, Deputy Erick Gelhaus, 48, shot him seven times, according to authorities. The shooting sparked several protests across Santa Rosa and the Bay Area alleging police brutality against predominantly low-income groups of color.